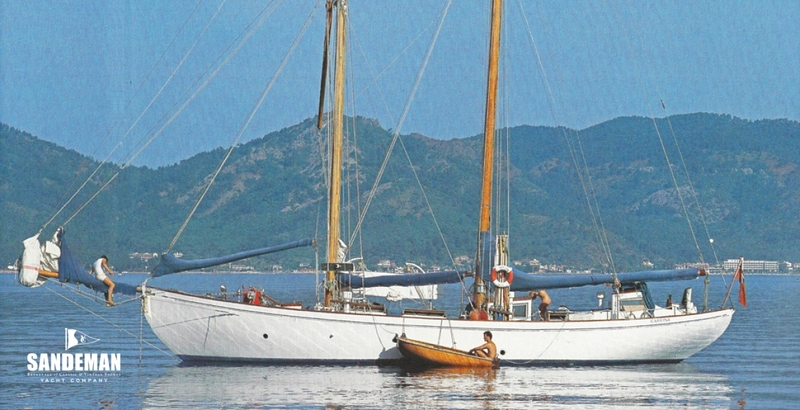 Many yacht designers achieved fame through the prowess of their racing yachts. 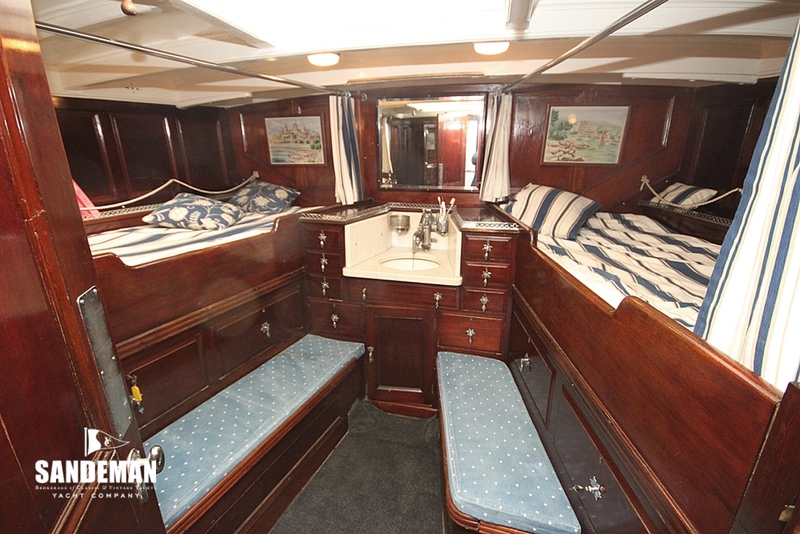 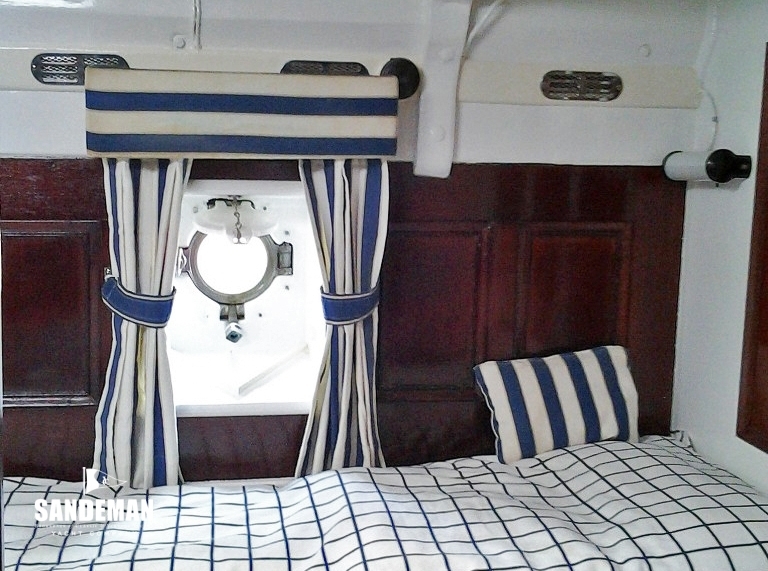 Fred Shepherd by contrast is famous for cruising boats; always beautiful with the sweetest sheers but with spacious and thoroughly well thought out accommodation. 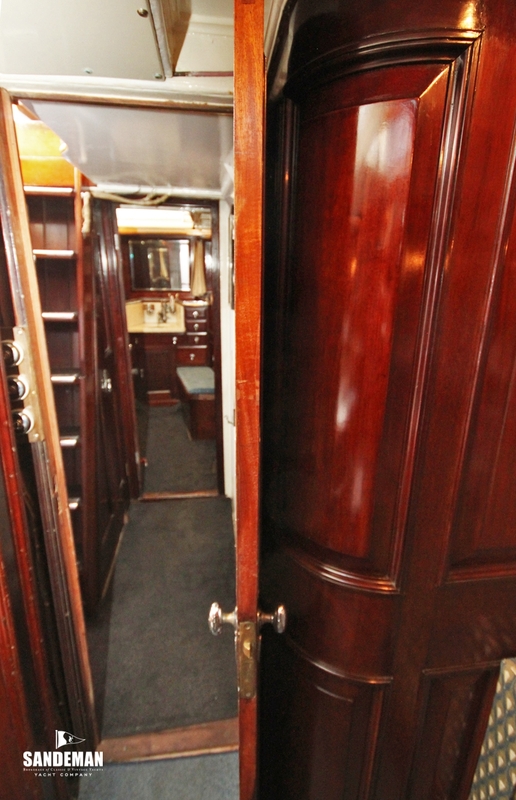 CARRINA has much of her original detail - indeed her interior joinery exquisite at build, remains so to this day. 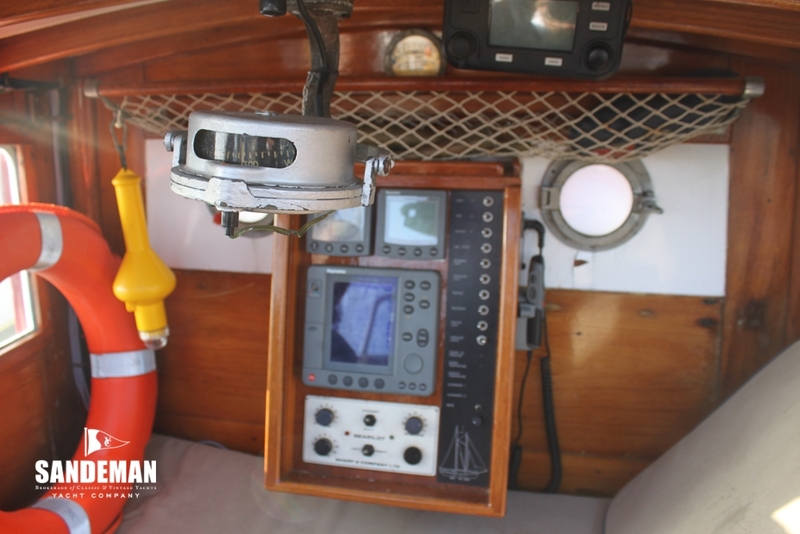 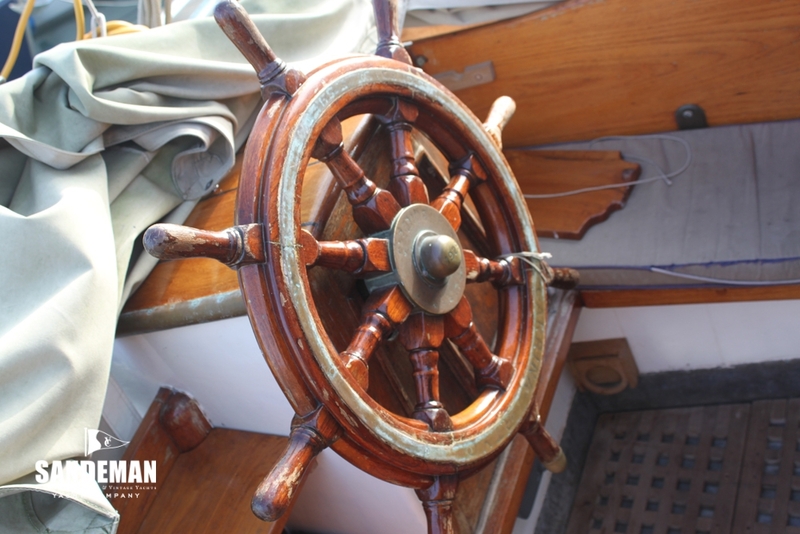 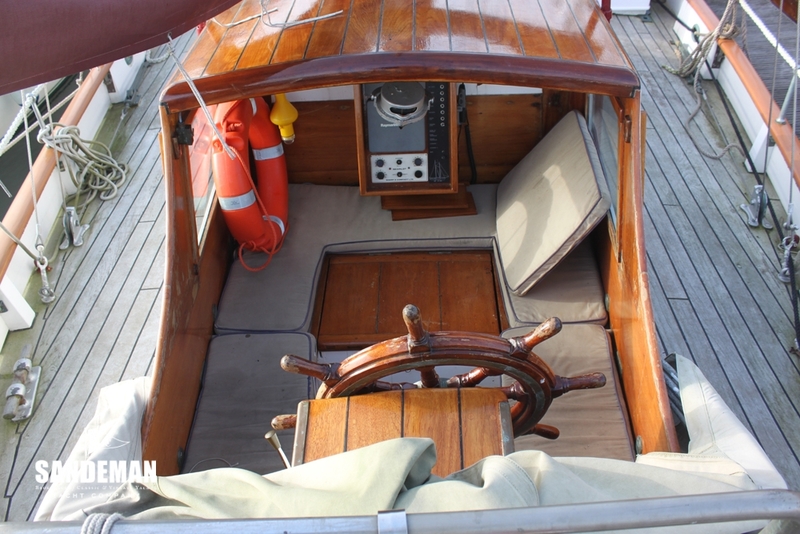 With her handy rig it is not hard to imagine her cruising in the 1930s for her owner and guests with just 2 crew or easily criss-crossing the Atlantic to be one of the first charter boats in the burgeoning Caribbean scene of the 1950s. 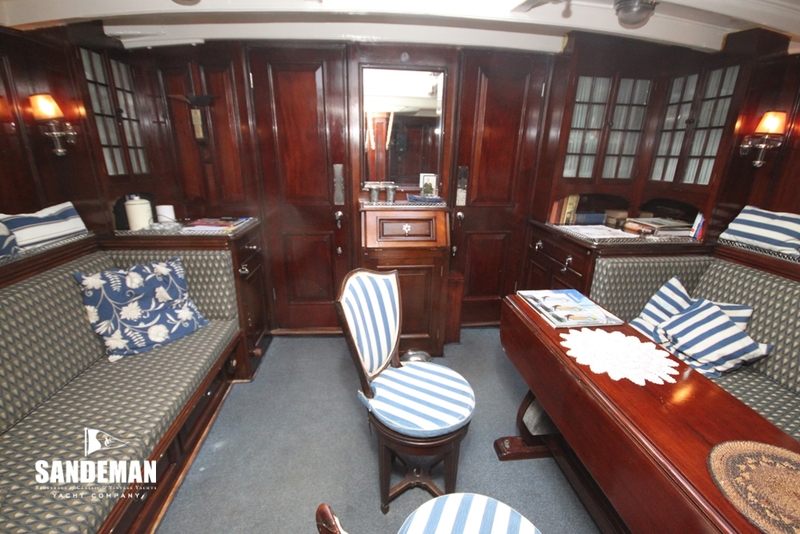 CARRINA epitomises not only the skill of her designer but the very essence of an English yacht. 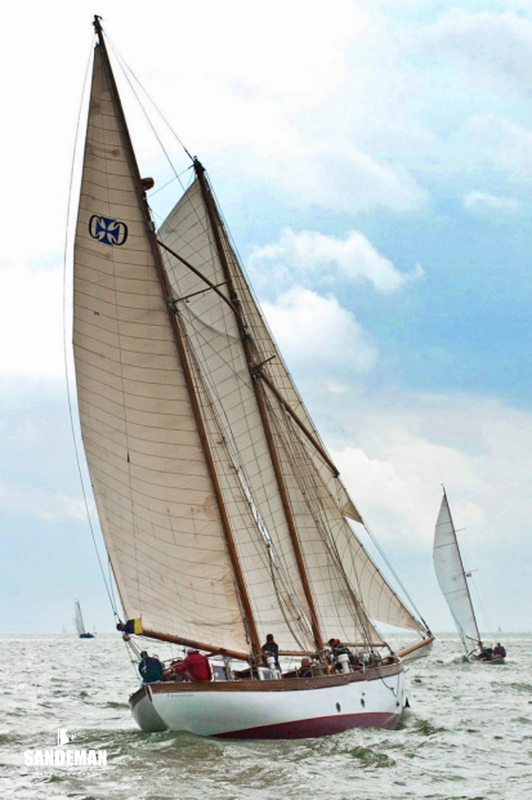 Commissioned for a Captain Westray, CARRINA was designed as an auxiliary centre shaft gaff ketch by Fred Shepherd and her build to Lloyds 18 A1 started in 1914 by R.J. Perkins & Sons in Whitstable. 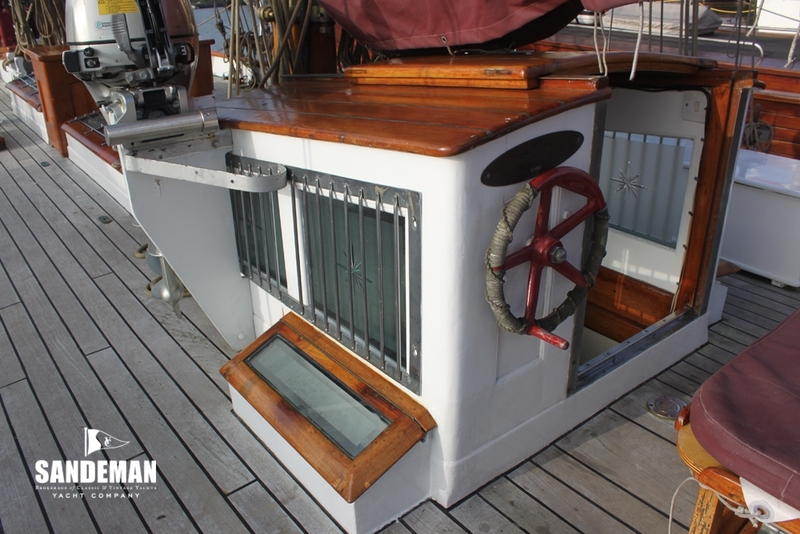 The hull was completed with deck housings but no deck when the Great War broke out and the captain subsequently killed in action. 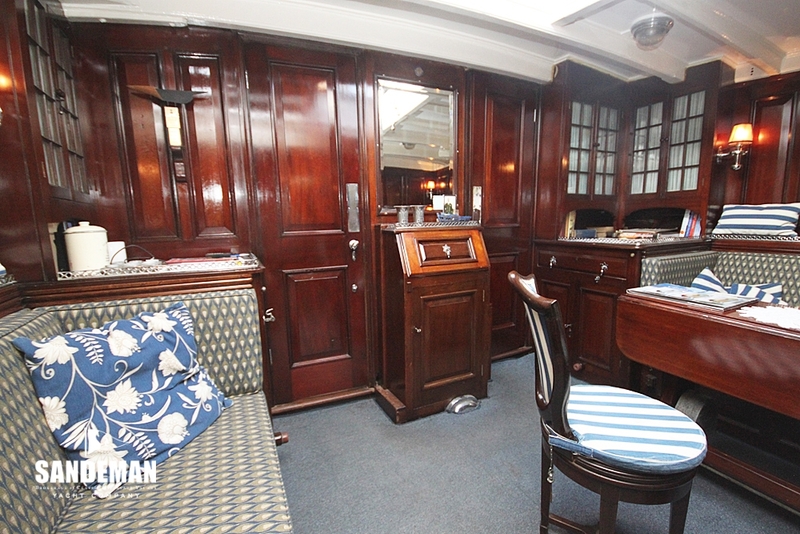 Kept in a shed for the duration of the War and beyond, her first 15 years therefore were spent drier than expected and in retrospect it was perfect seasoning for the fine Burmese teak and English oak frames, fastened with copper and bronze simply to have waited to be launched eventually in 1929 for Mr G.F Carrington. 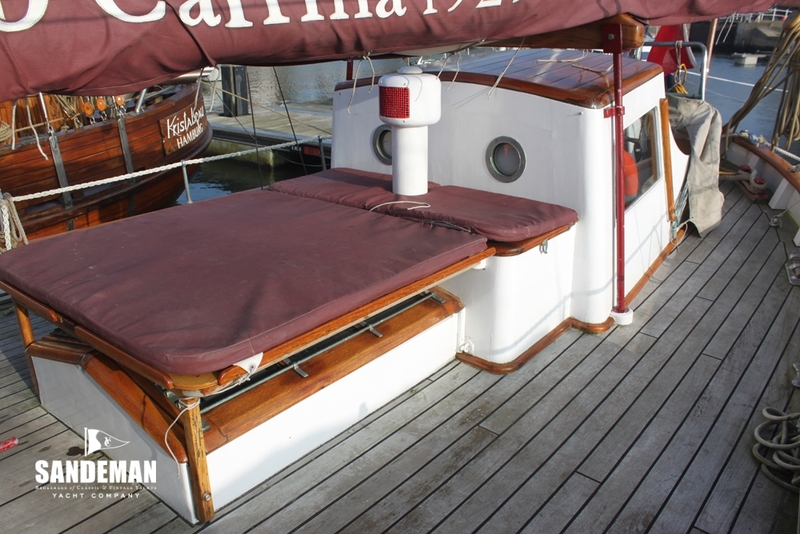 Although, CARRINA had been designed as a ketch she was never built as such. 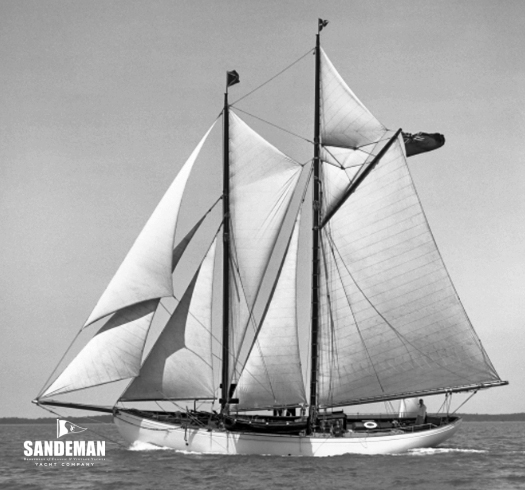 On launching in 1929 it was as a staysail schooner. 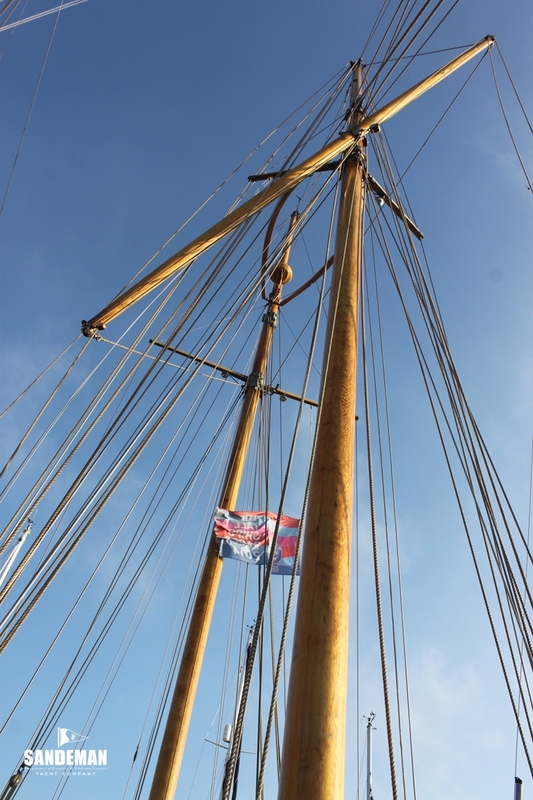 Whereas normally the space between the fore and main masts takes a boomed staysail, here the gap between the masts is filled with a wishbone sail almost above the boomed staysail. 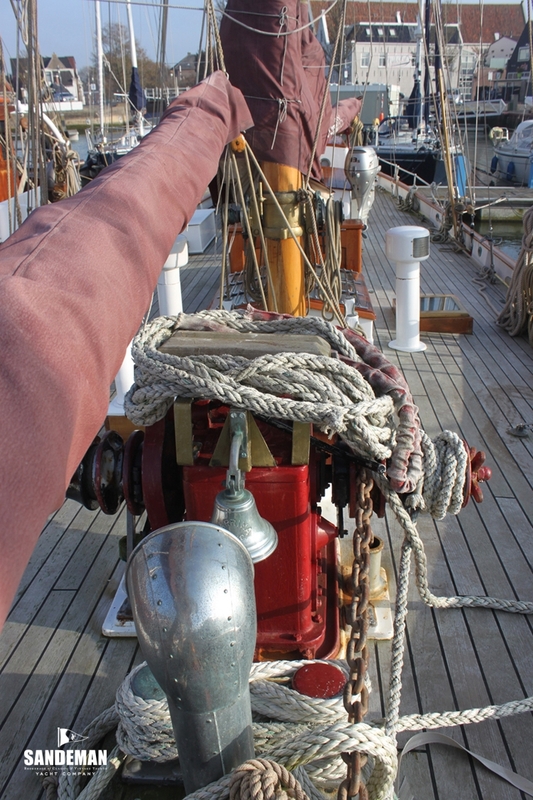 The advantage is, she is easily handled and reefed by a small crew – Tacking is easier as the boomed sails are self-tacking without the need for sheet handling. 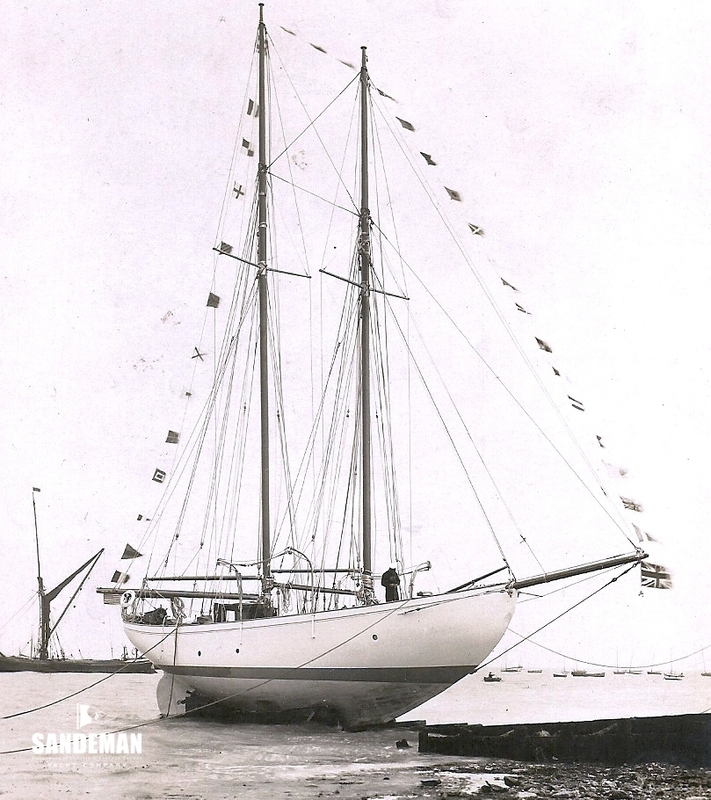 During the Thirties, she was de-rigged every winter, her masts taken down and the ship stored in a barn at Camper & Nicholson’s in Southampton. 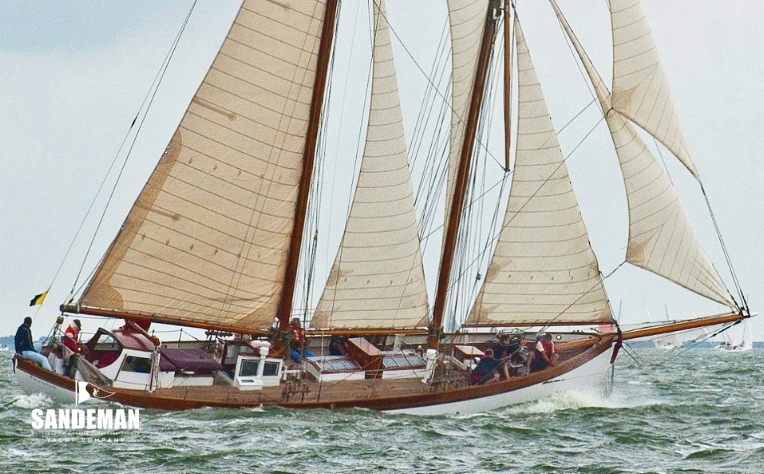 CARRINA was the first (European) yacht with a running wishbone sail. 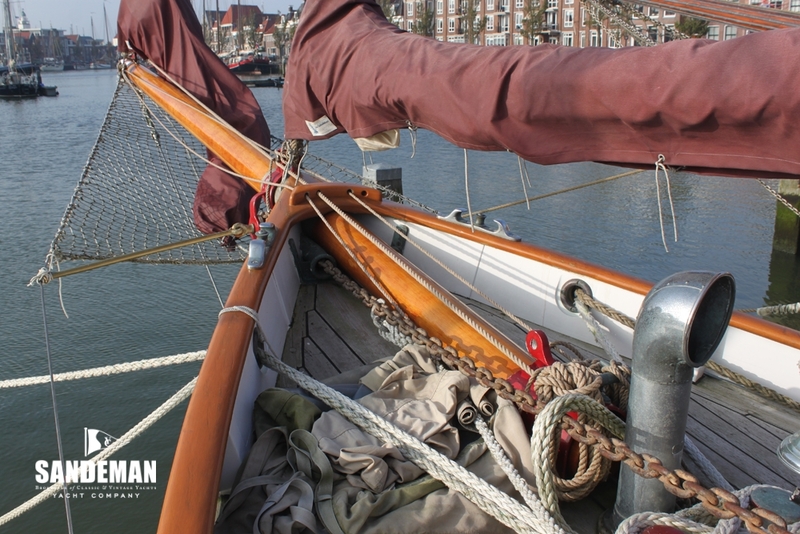 Between 1934 and the outbreak of the 2nd World War, she sailed mostly with the owner at the helm and a small 2 man professional crew, in the Channel and as far as Casablanca and the Canaries as well as the Baltic. 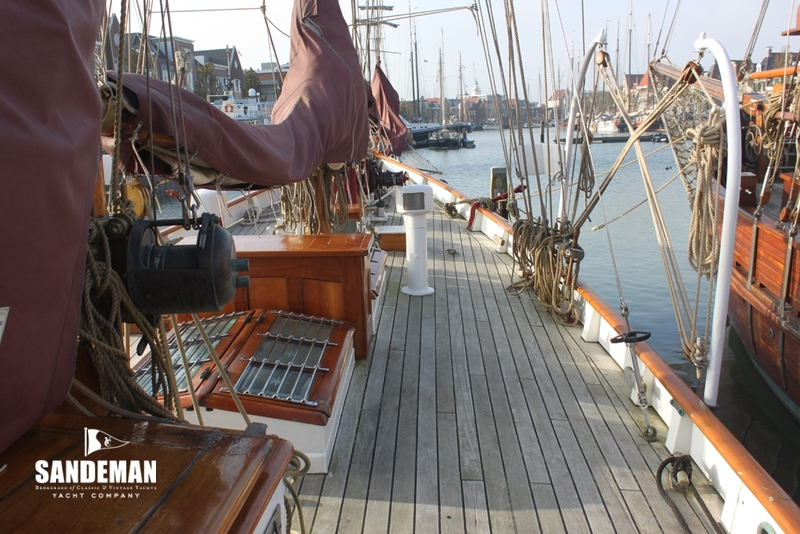 She was even in Kiel harbour shortly before the start of the War. 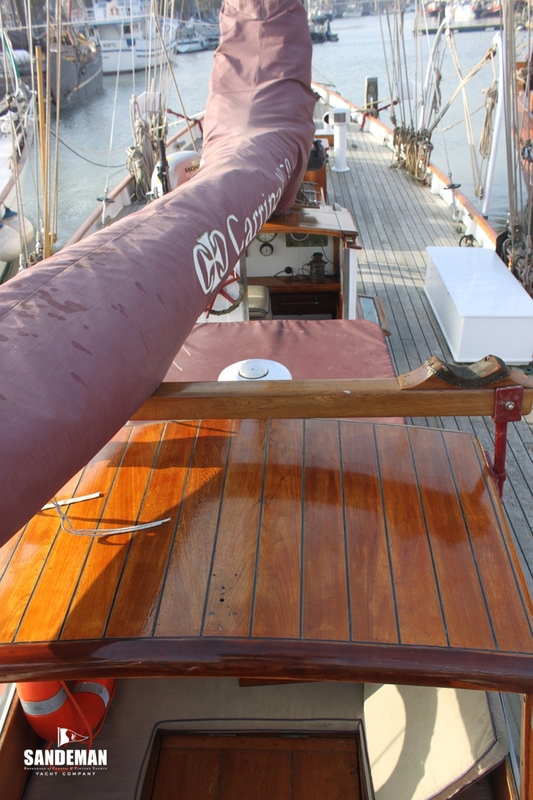 She survived that war, de-rigged in a mud berth at Camper & Nicholson’s with the spars stored ashore in a shed. 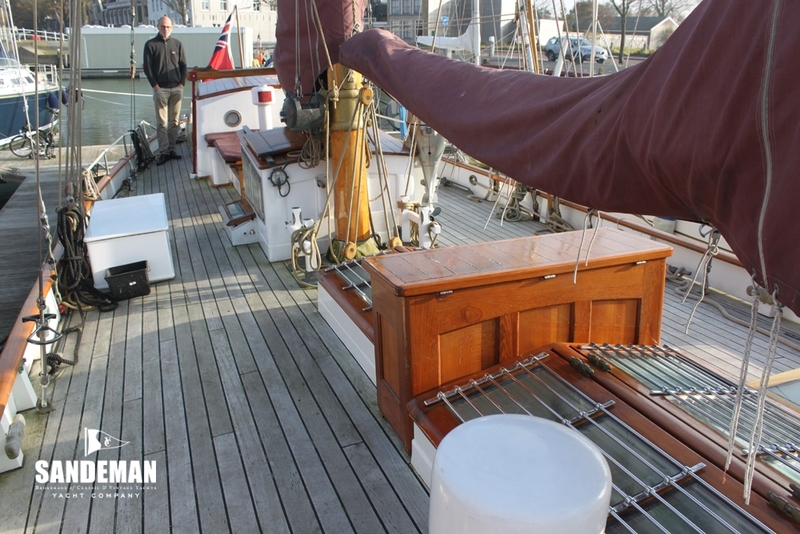 All of these McGruer spars were destroyed during the Southampton blitz, except for what is now the main staysail boom - and the gaff which is nowadays used as the square yard. 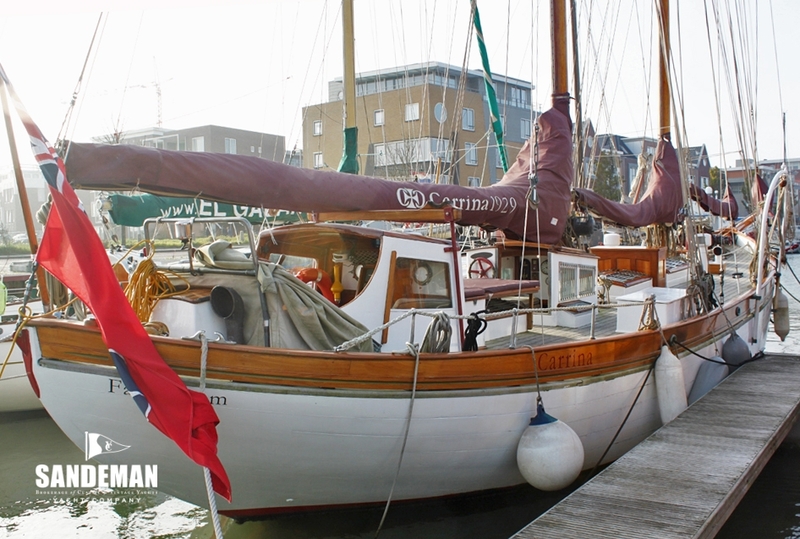 After the War, when CARRINA came out of hiding she sailed in the Channel out of Poole in Dorset; the family enjoying a lot of mackerel fishing. 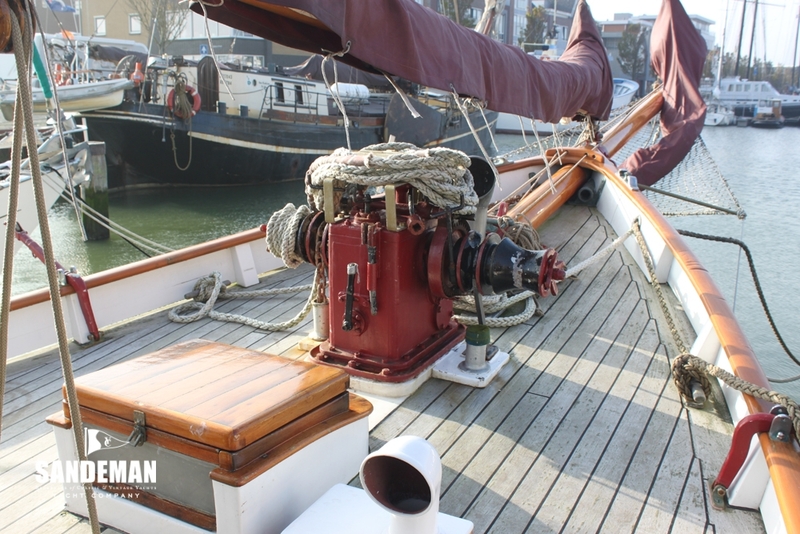 During an onshore gale, while in Portland harbour, her anchors dragged and she was almost dashed against some concrete defence emplacements left in the middle of the harbour – but saved from disaster by a Royal Navy launch. 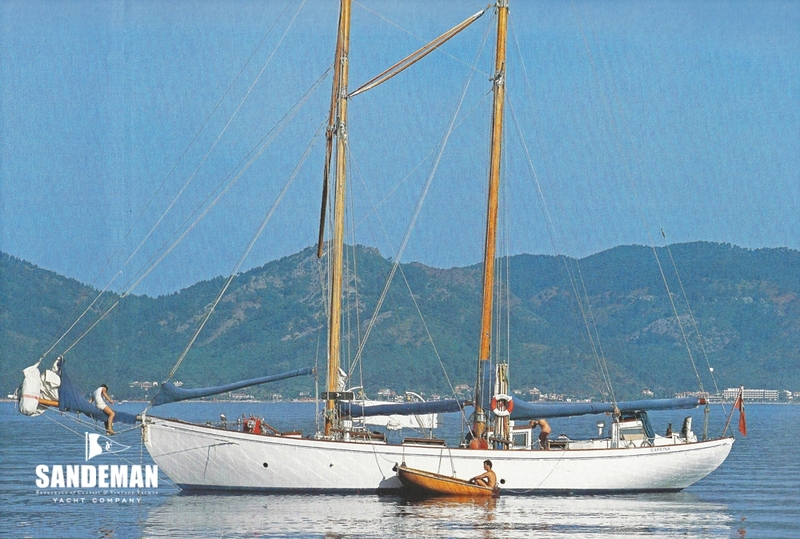 From 1947 to 1953 when the Staniland family bought her CARRINA cruised quite extensively around England and to France and Spain. 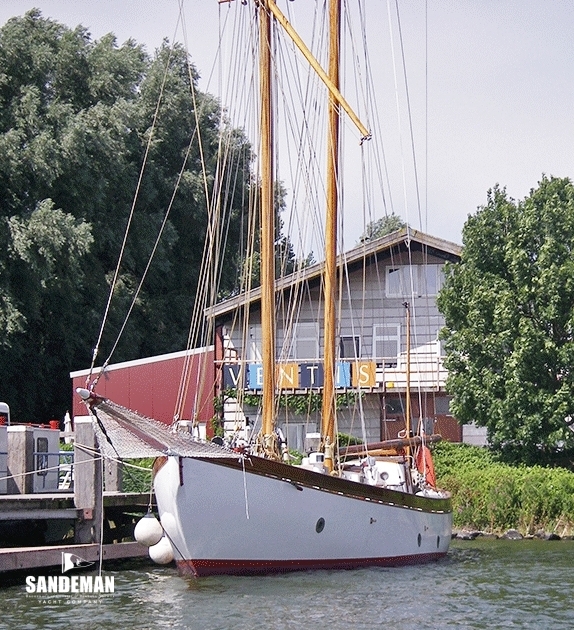 Some significant changes were made by the Stanilands. 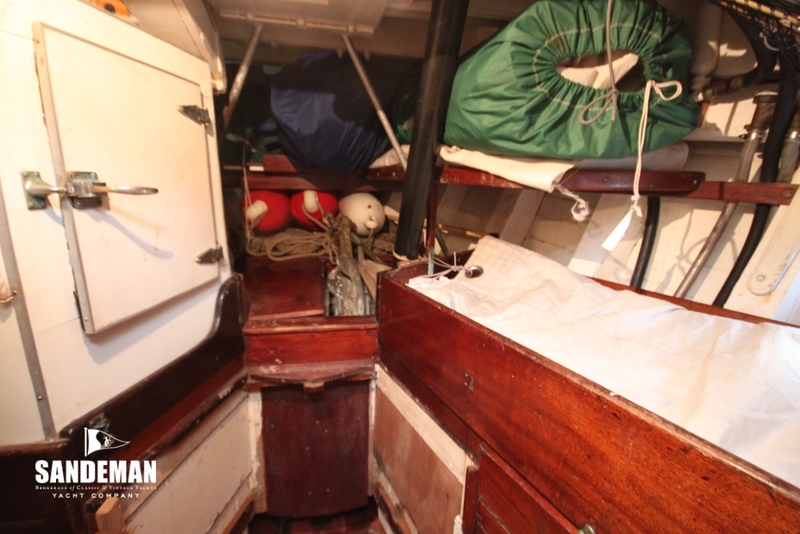 In 1956 the cockpit shelter aft was added at Campers and in 1966 there was a major refit in Malta. 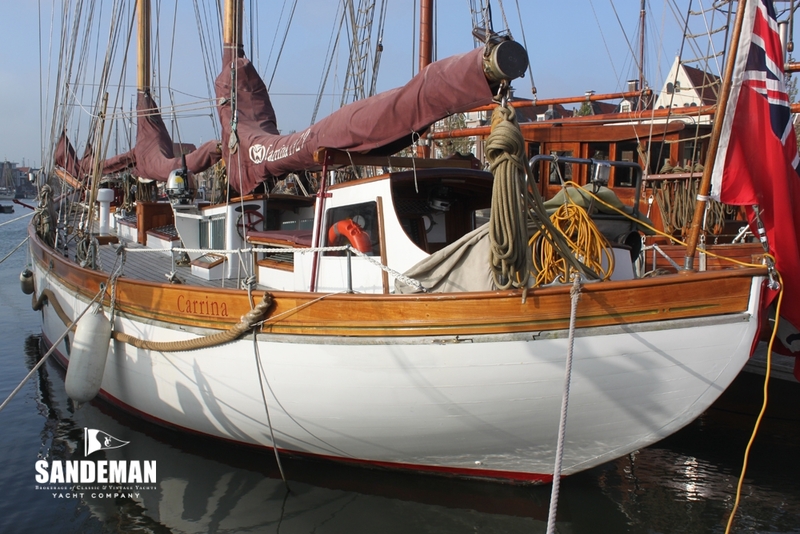 The Stanilands cruised and lived aboard CARRINA for 29 years averaging about 5,000 miles a year and during their ownership CARRINA made 6 Atlantic crossings. 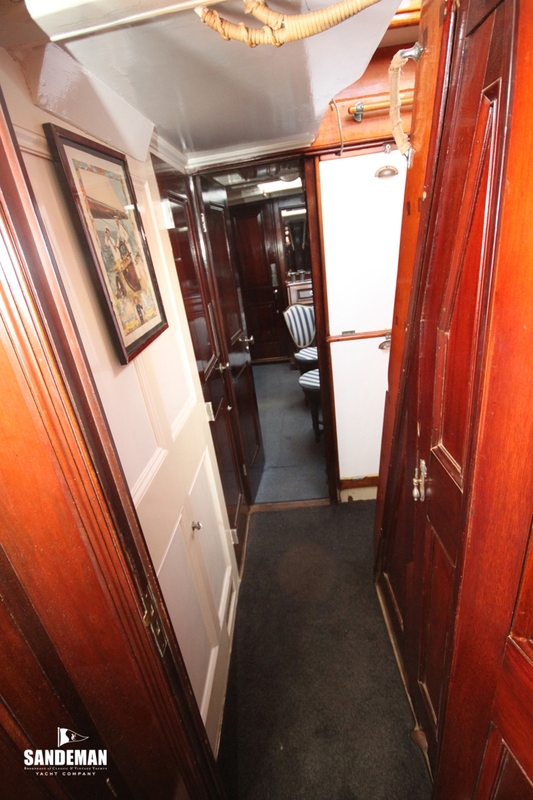 Their son Ian, born on board subsequently made his own crossing in 1969 earning in his own right membership of the Ocean Cruising Club of which his parents had been founder members. 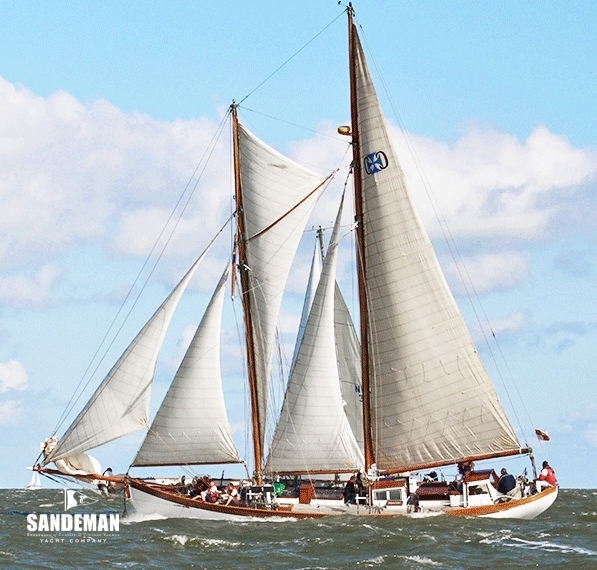 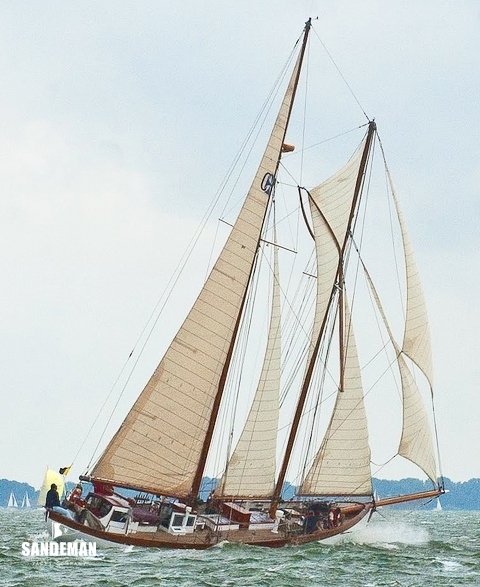 Given the high skills and quality of her build CARRINA is a wonderful example of the English Maritime heritage. 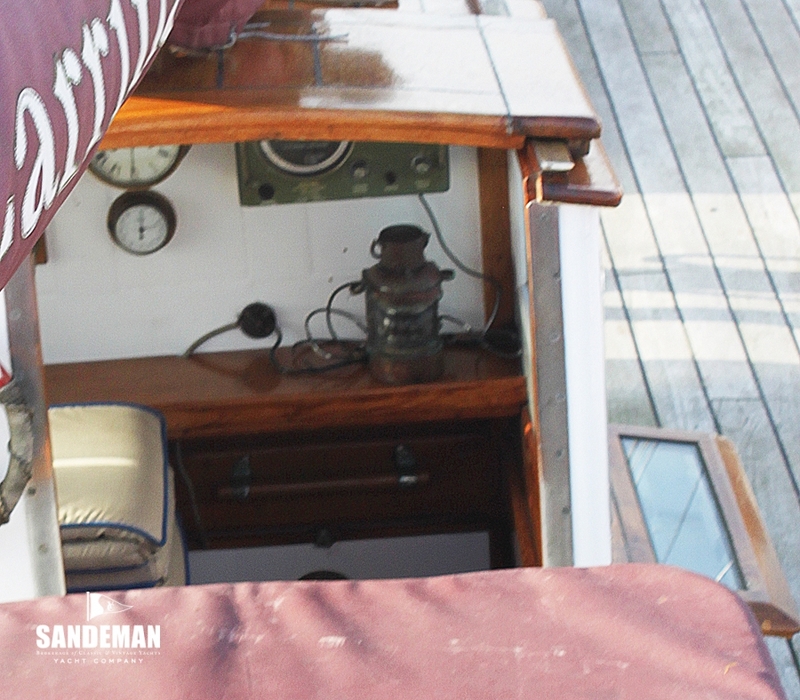 That she survived her first century should also be attributed to the successive owners have maintained her throughout with tender loving care. 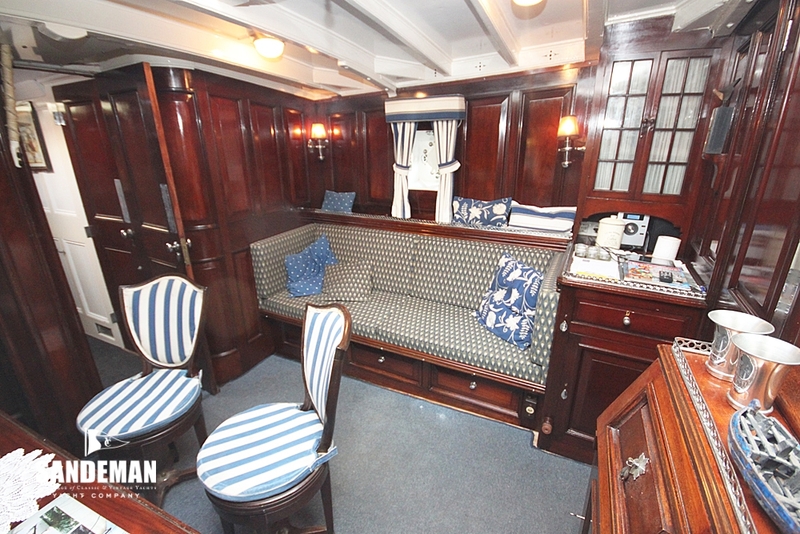 CARRINA’s interior deserves special mention. 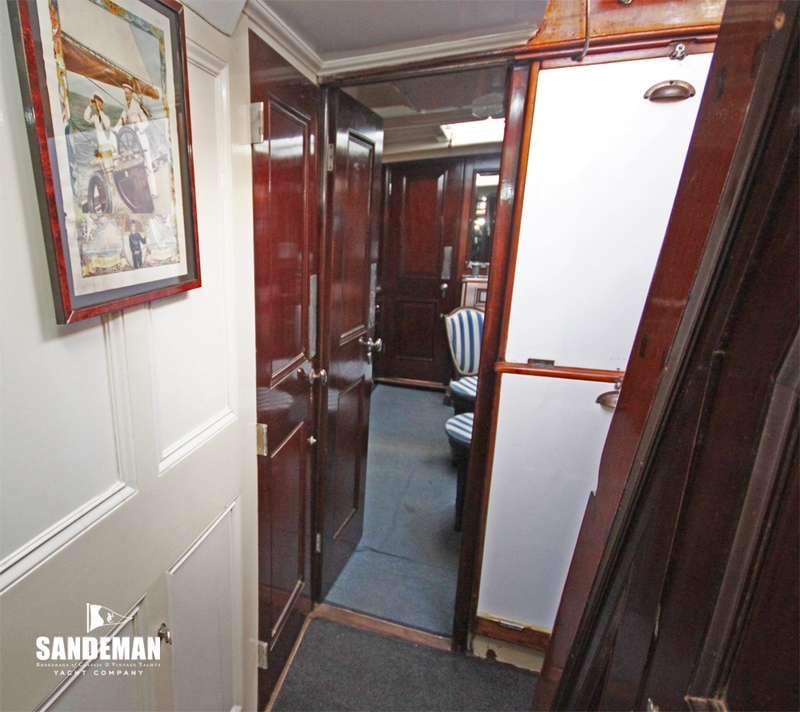 Only the finest Honduran mahogany was used in its construction; hand crafted and French polished by Robertson’s of London, who were accredited with fitting out some of London’s most prestigious shops at that time. 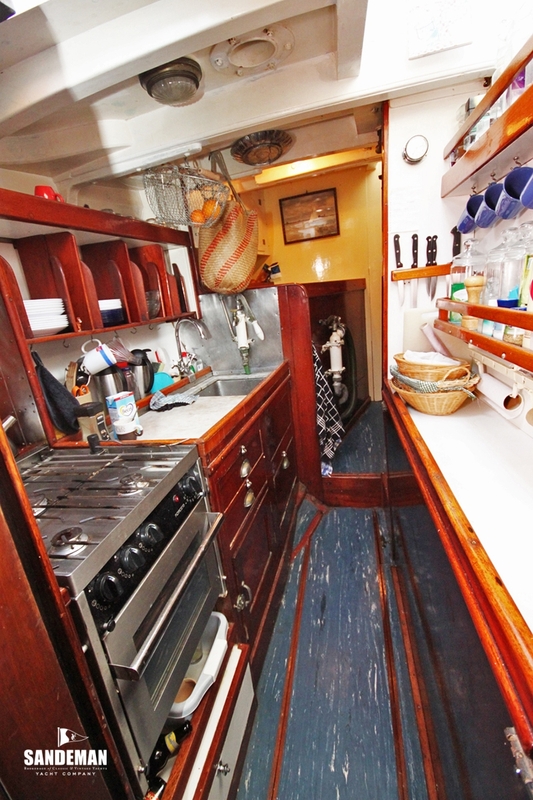 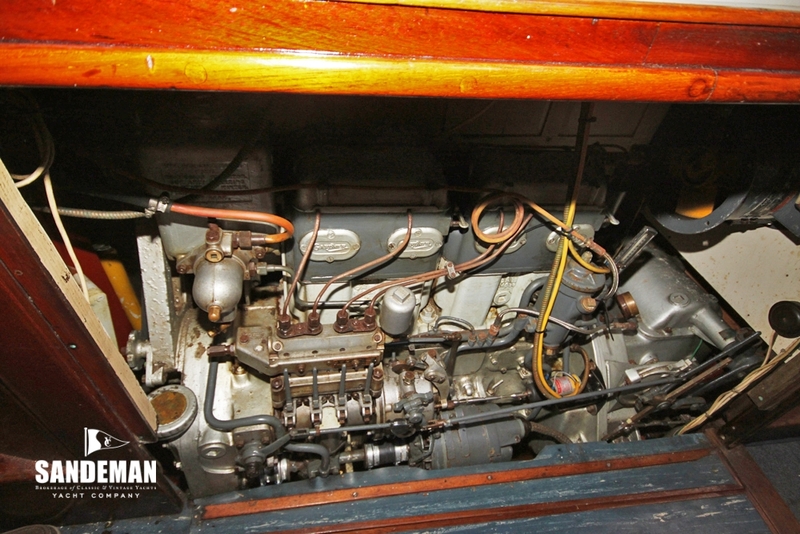 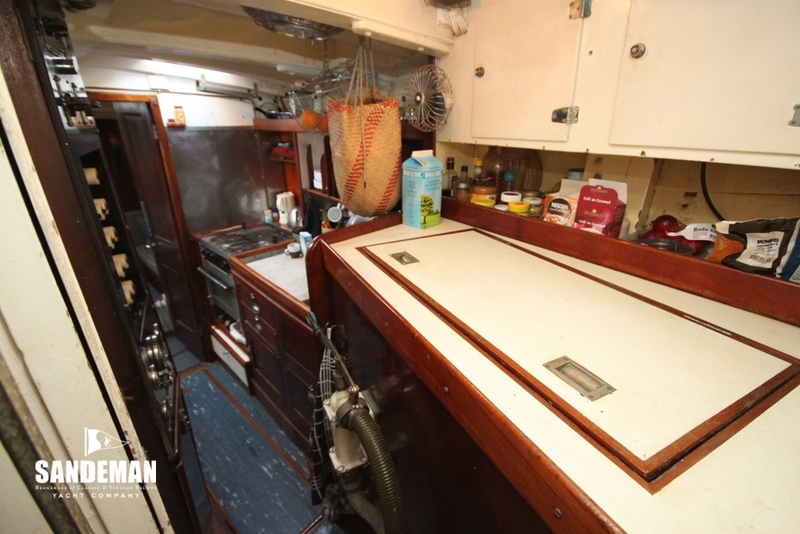 The interior remains almost as intact as the day she was fitted out. 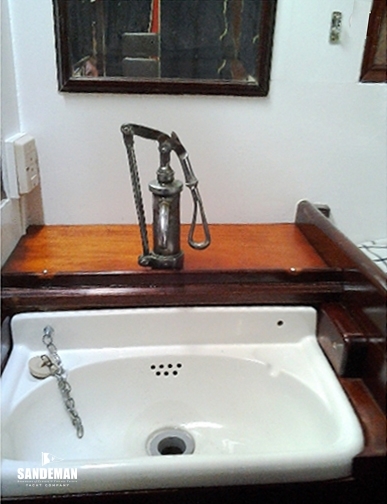 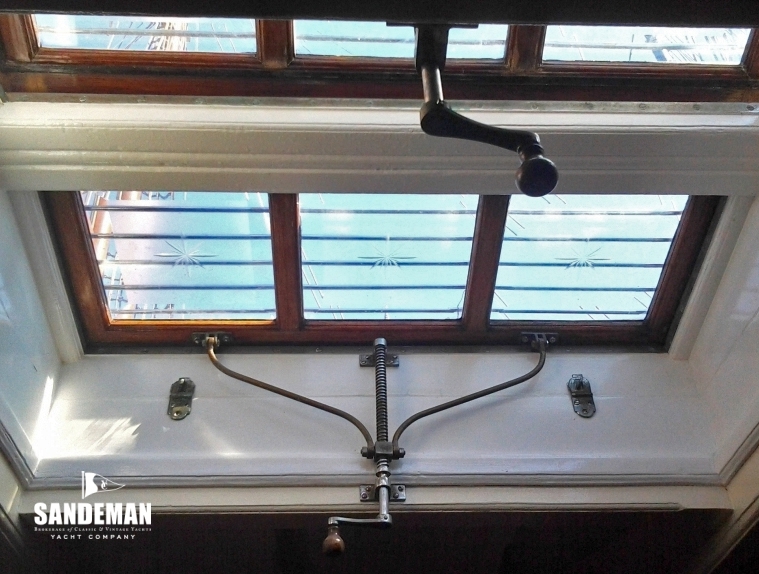 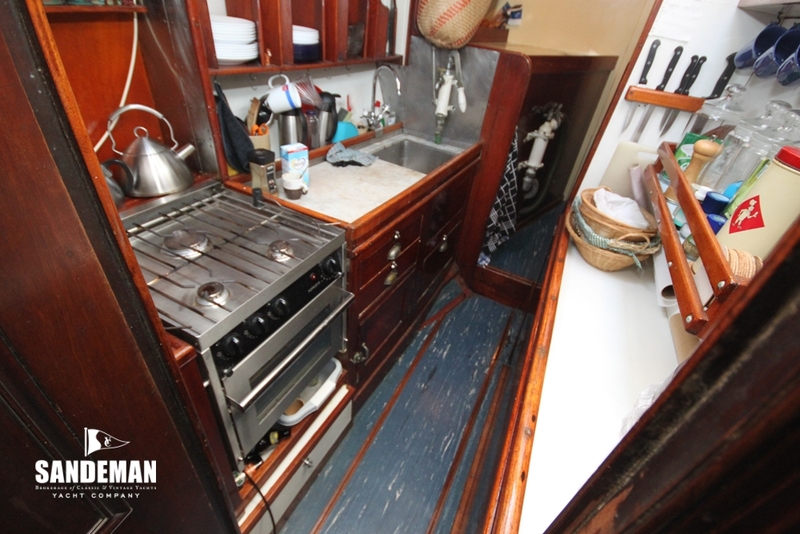 Thus in the cabins, the original plated pumps and marble top wash basins are still in place, as is the French polished mahogany panelling. 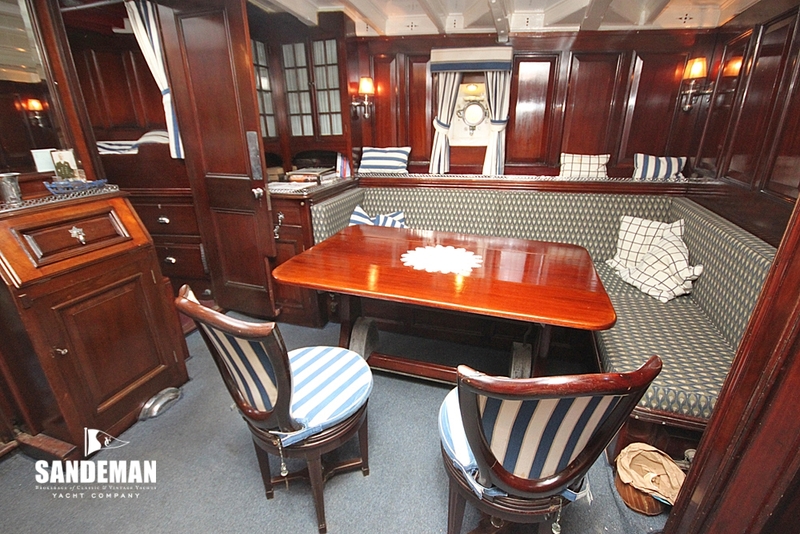 The gimballed dining table and fixed mounted turning chairs are all original and wonderfully preserved with the patina that only comes with age and imbuing the atmosphere of the thirties yachting era. 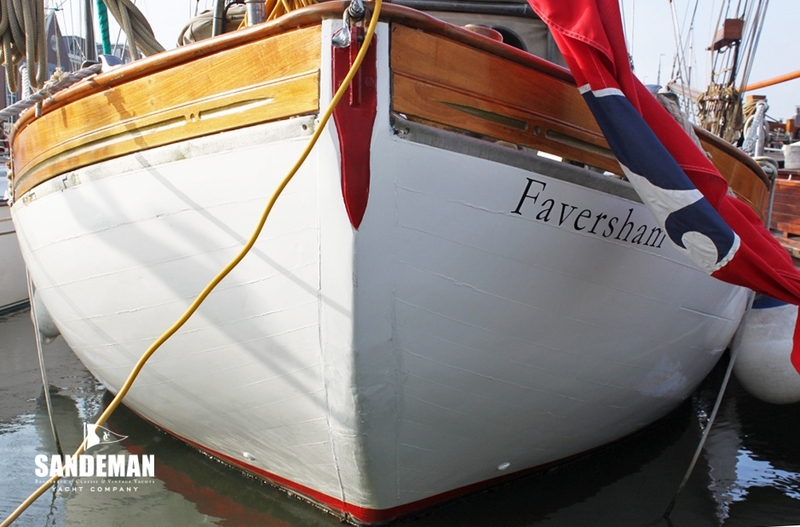 Despite the genius of her designer and the excellent craftsmanship of the shipwrights it is well recognised that a classic yacht can only survive through the careful maintenance of her successive owners. 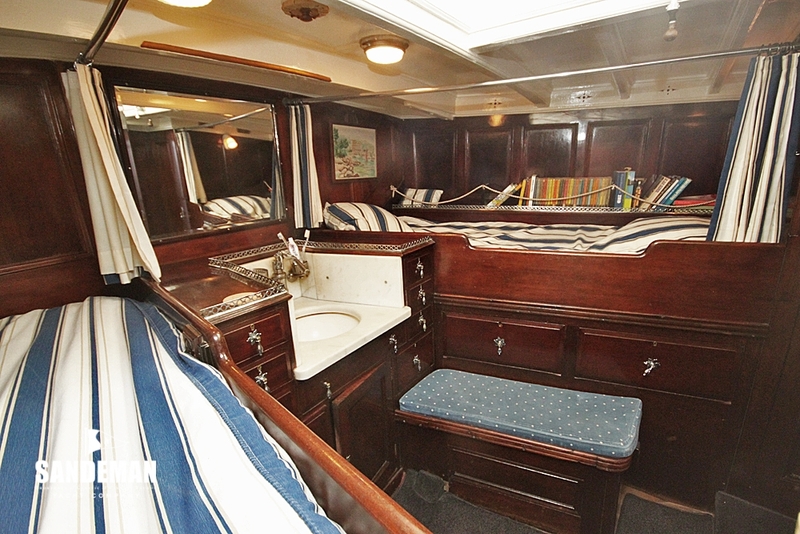 Over the years the Staniland family did many refits at Camper & Nicholsons and in Malta. 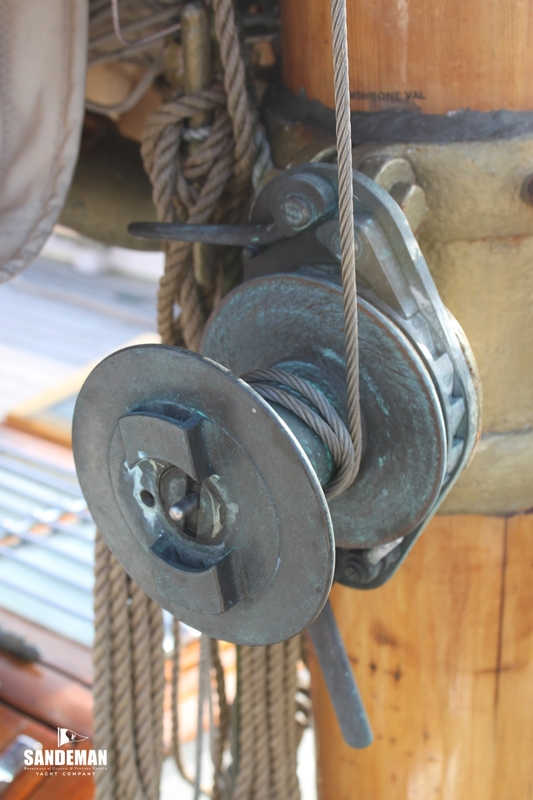 Initially the masts were unstepped and a track added to the main mast and 10 ft cut off the main boom, to convert her to a Bermudian staysail schooner for easy handling in the Caribbean. 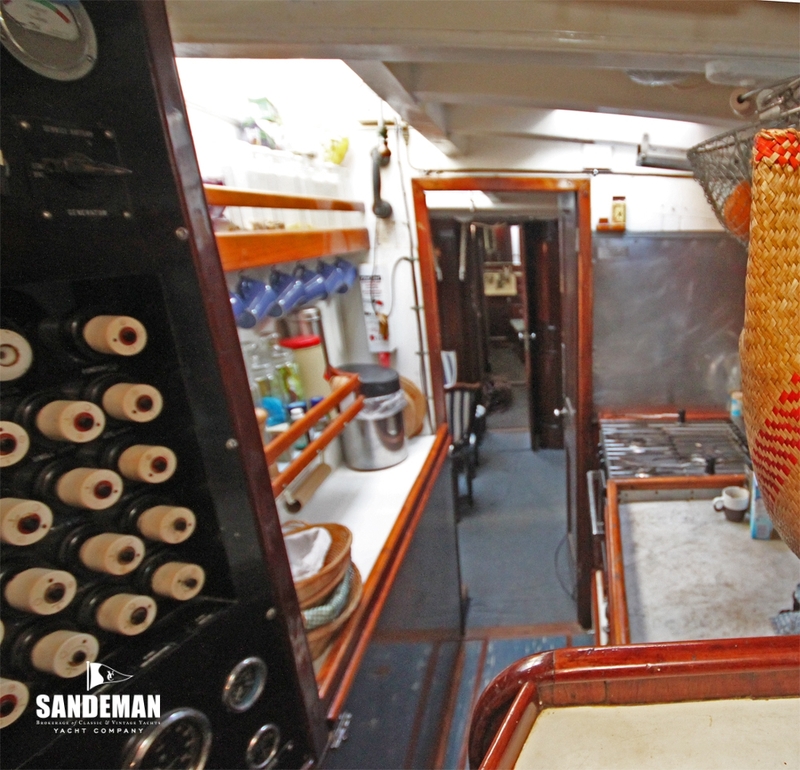 The old main gaff was converted into the present square yard with 6 ft scarfed in. 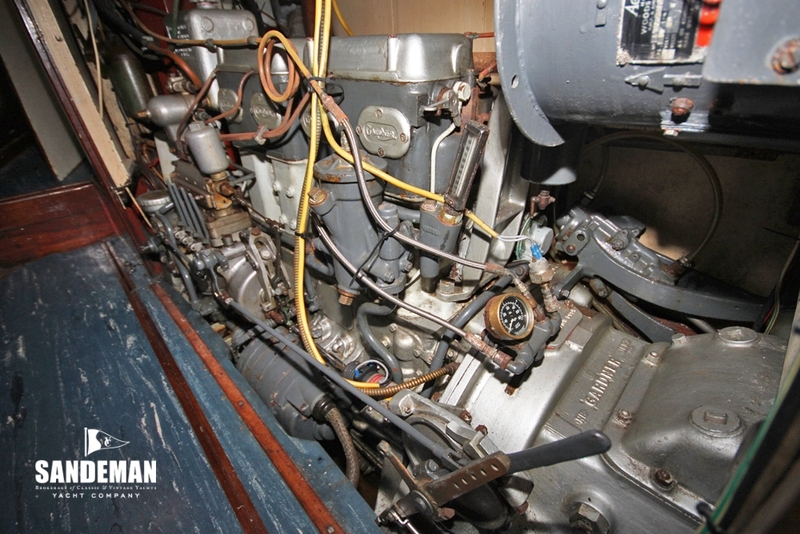 The cockpit shelter aft was added in 1956 at C & N. In 1966 the boat was completely re wired and received a new electrical panel, new main engine beds and a new diesel engine; the Gardner 4LW. 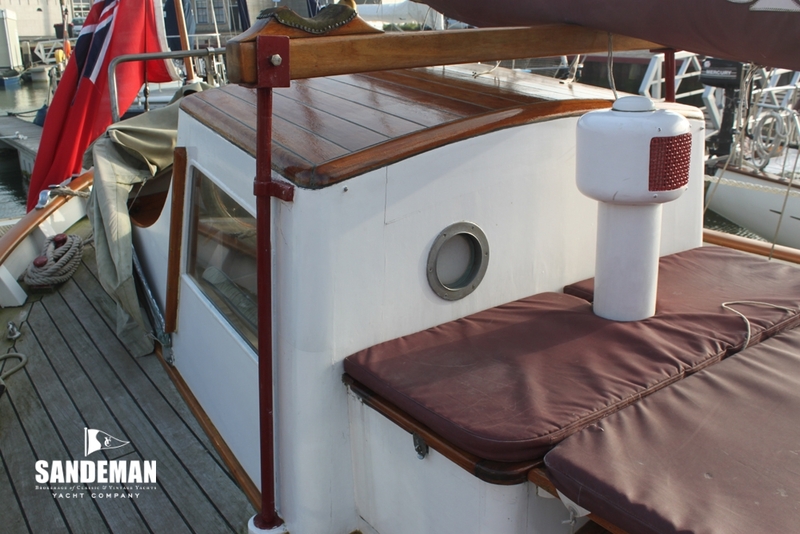 In 1973/74 father and son Staniland renewed the decks with 2 layers of 3/8th inch marine ply screwed to the beams and 1inch teak. 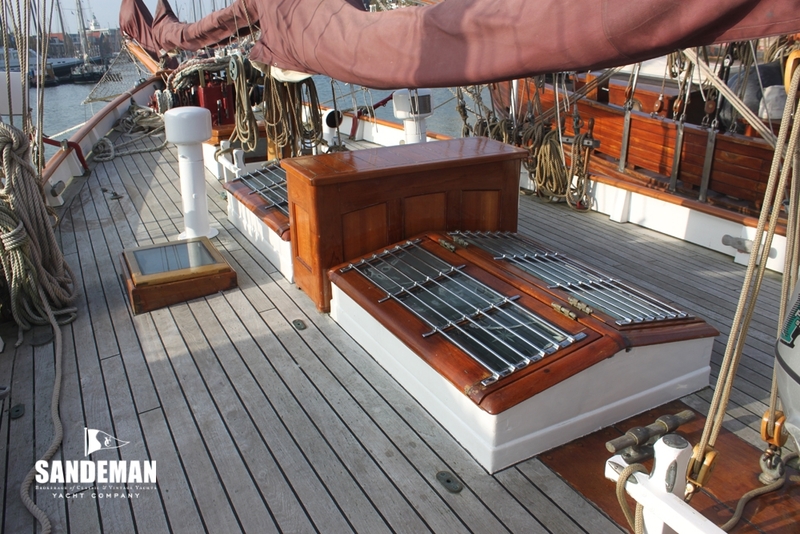 They hand screwed 6,000 silicon bronze screws into this deck. 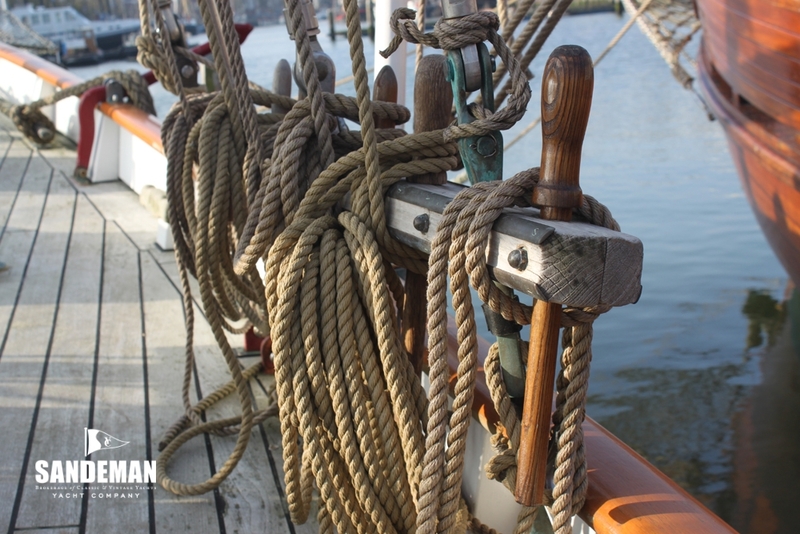 In the years 2009 and 2010 all the stanchions are renewed and intensive control and maintenance of the masts and spars did took place. 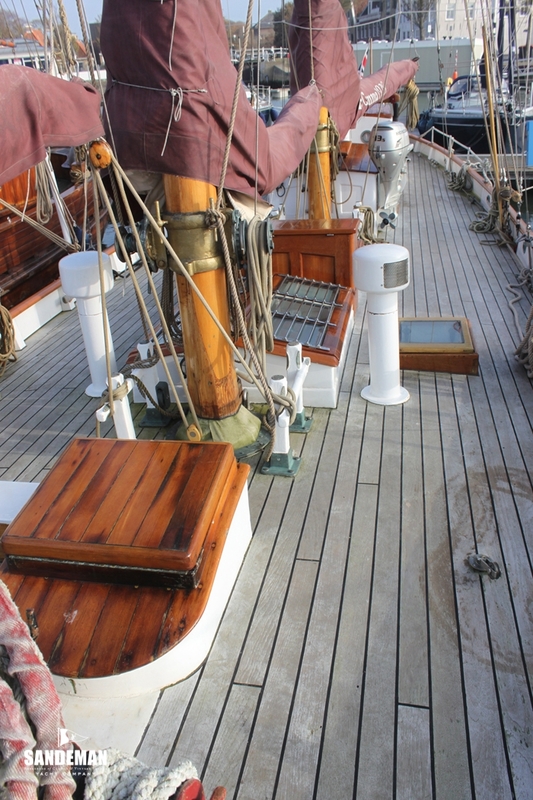 Also complete new varnishing and painting masts, spars, hull and deck housing. 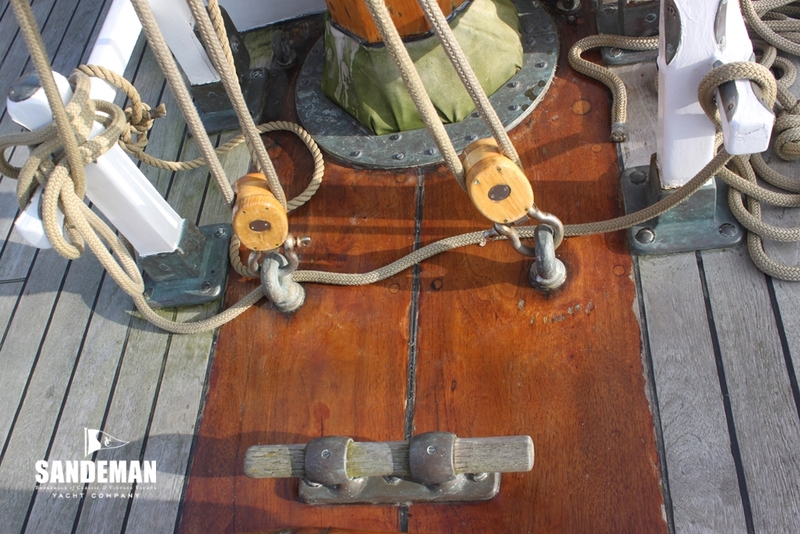 Leaks around the oak stanchions required their total replacement along with the bulwarks. 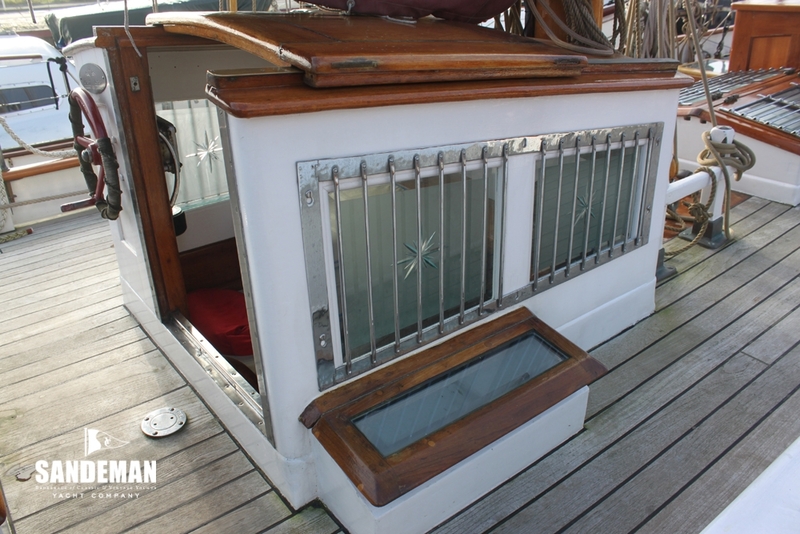 The stanchions supporting the bulwark and capping-rail had deteriorated through years of exposure to salt and fresh water. 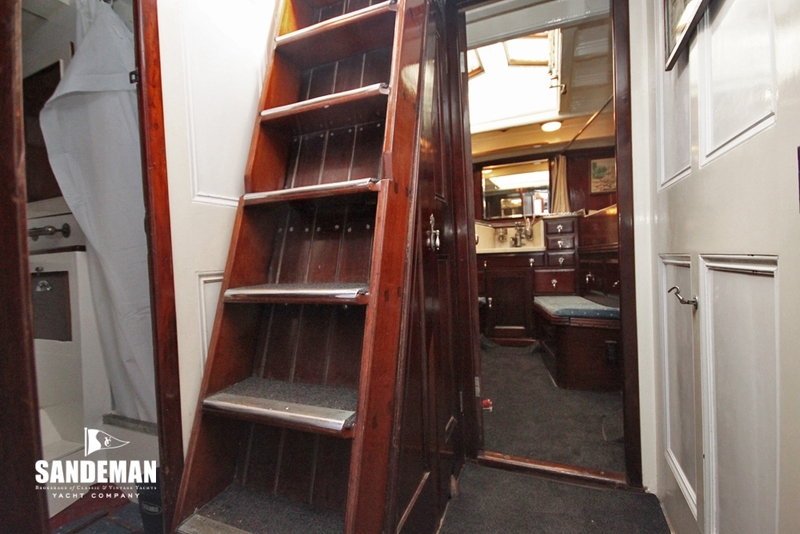 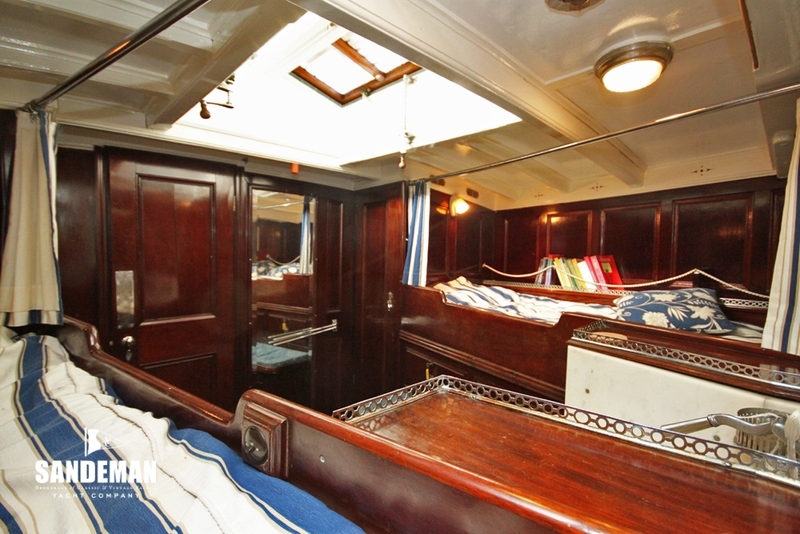 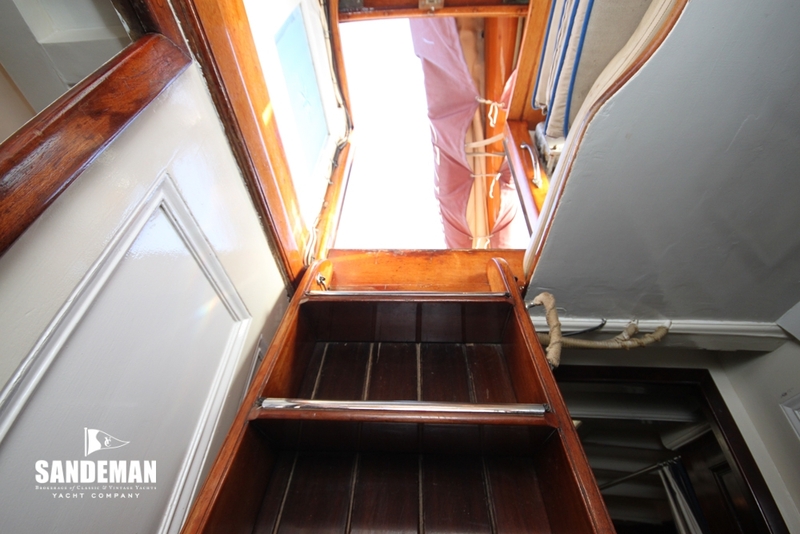 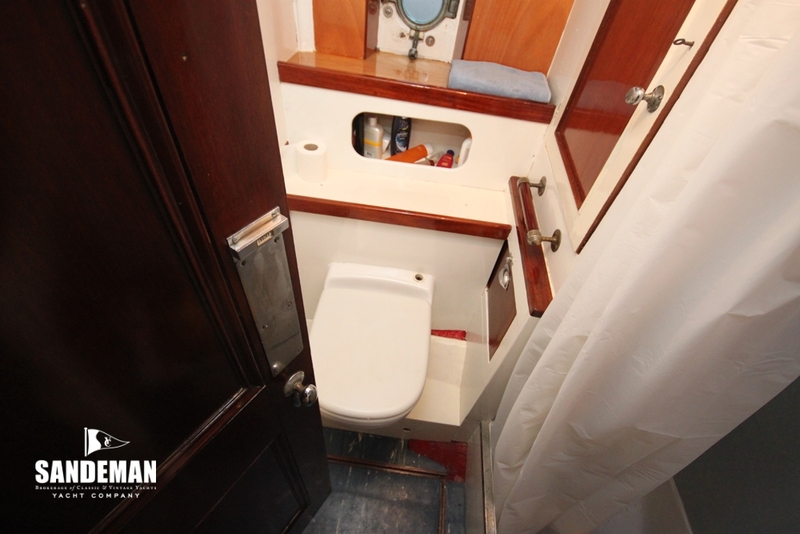 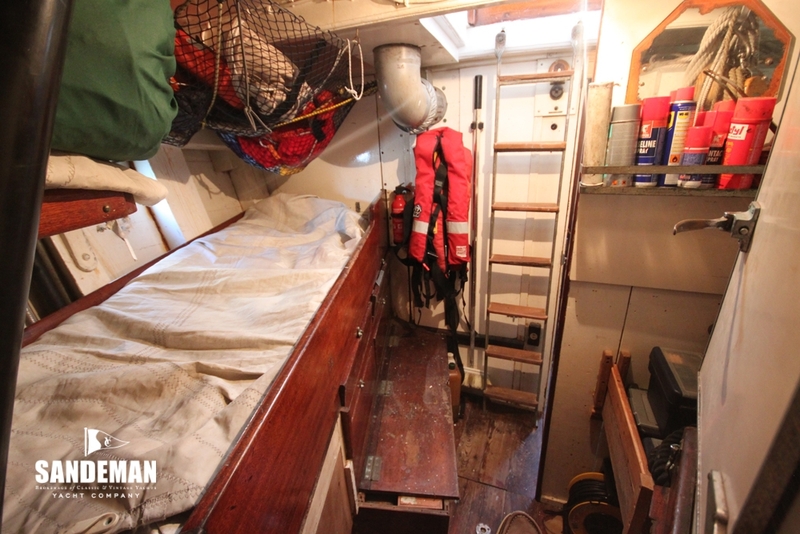 Without removing the original teak deck-planking and covering board but reusing the original capping-rail, the original mahogany interior panels, had to be completely removed. 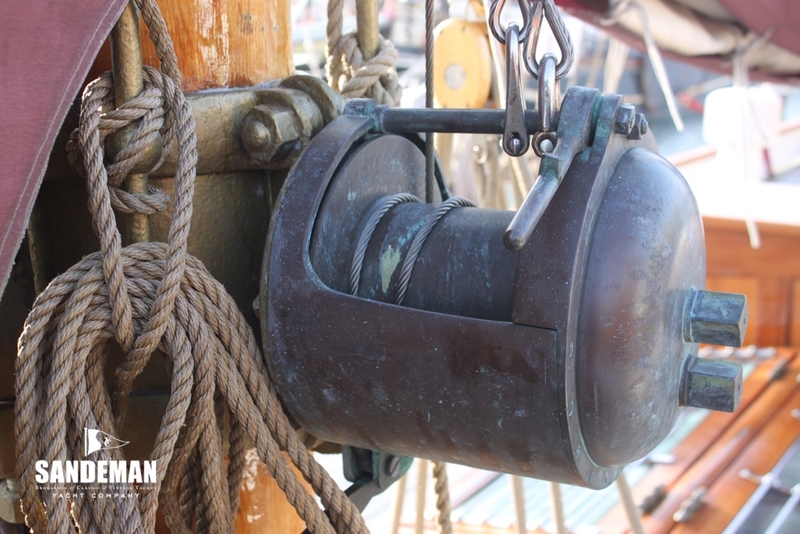 The stanchions have been replaced by Guariuba. 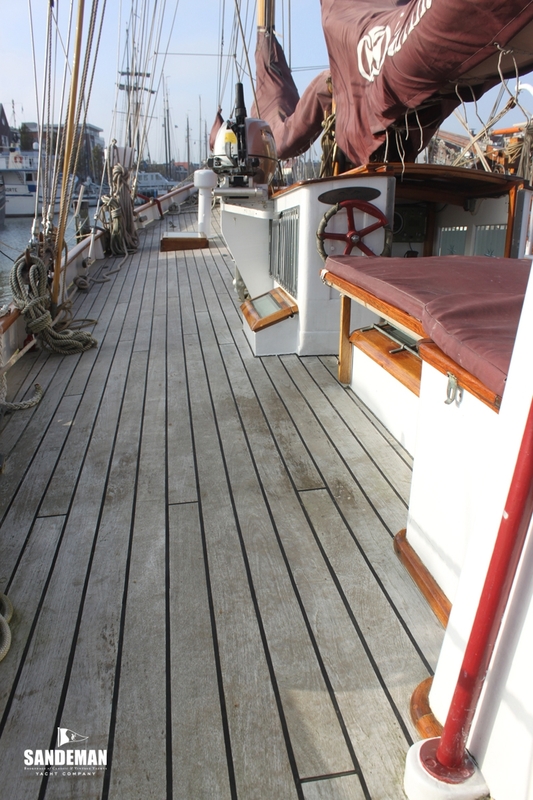 This wood; yellow in colour is quite resistant to fungi and dry wood borers. 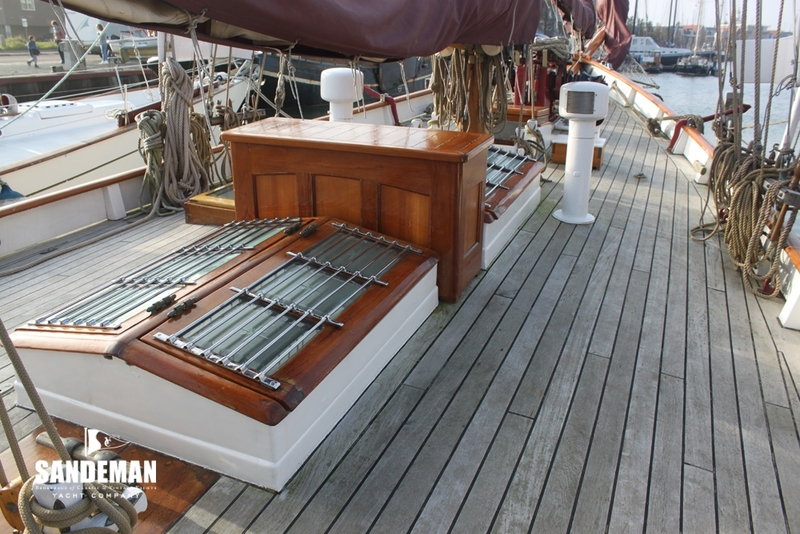 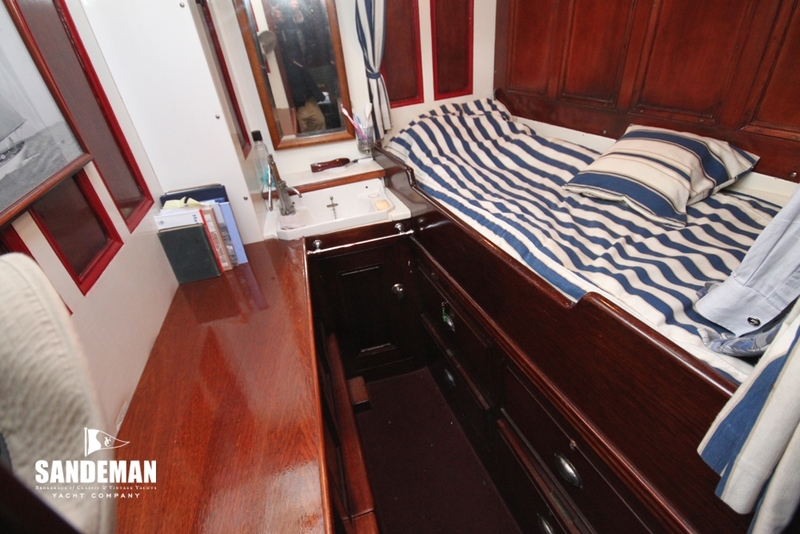 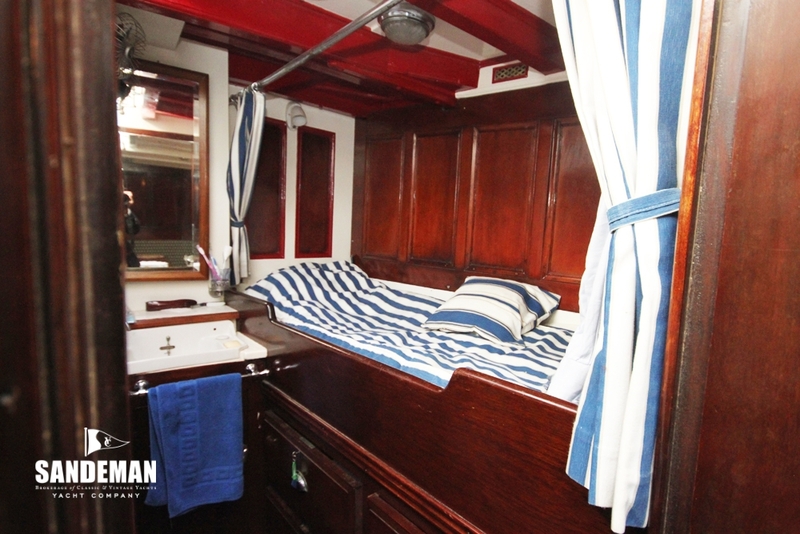 The full bulwark is now finished in teak and varnished, while it should be noted the original bare hull planking was still found in perfect condition. 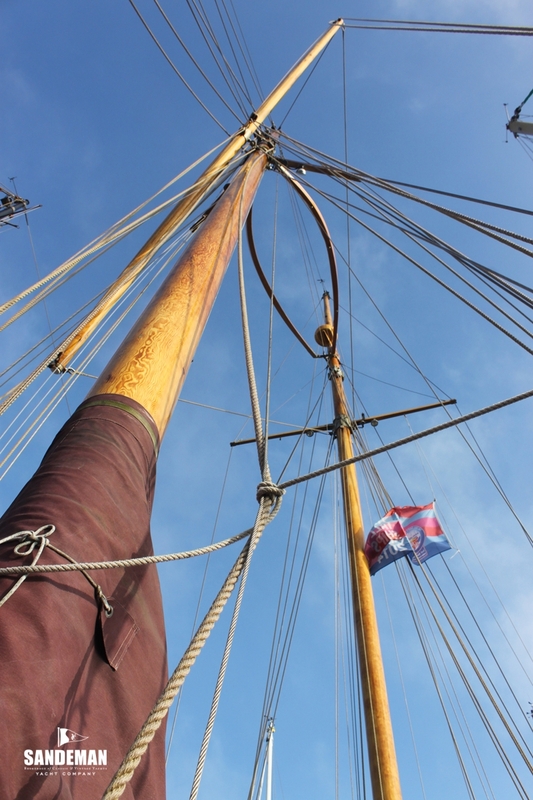 Upon inspection the shipwrights also found some rot in the main mast; now repaired without compromising strength. 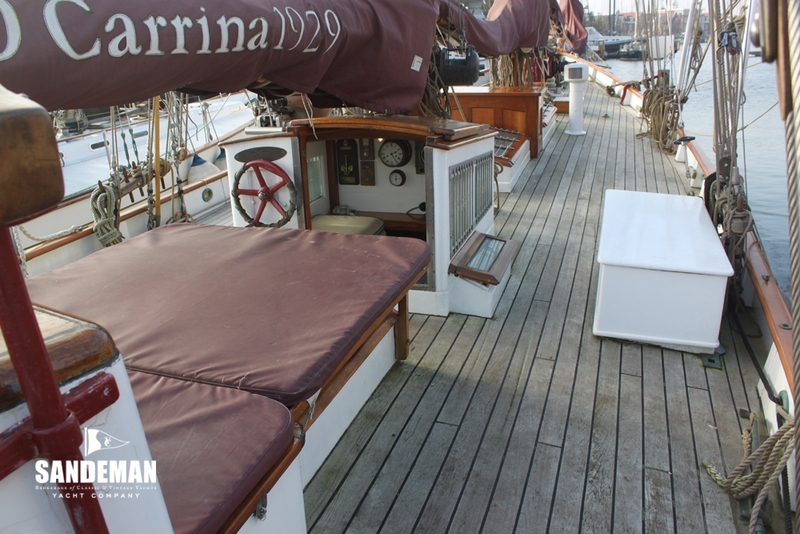 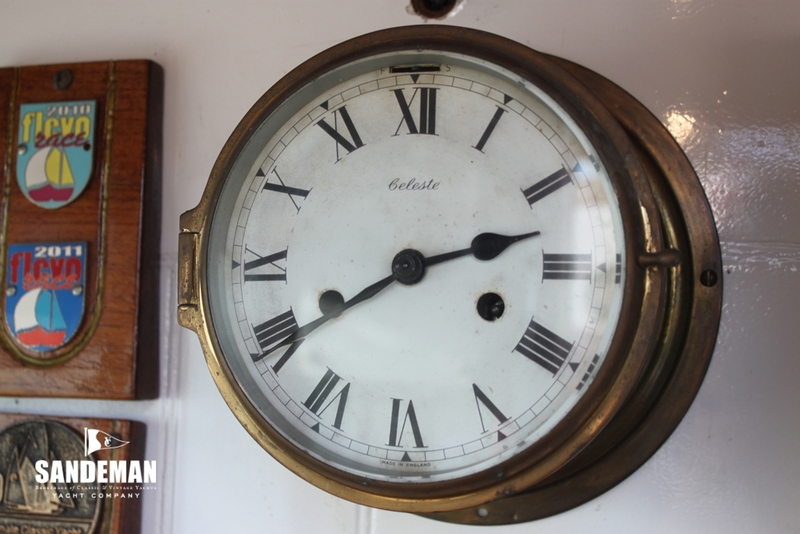 The masts and spars are believed to have dated from 1946, evidenced by a silver florin dated that year found under the main mast.